11th January 2017- During the first three quarters of 2016, in annual terms, the price of electricity has fallen in the main wholesale markets of Europe. The decline in the prices of fuels for electricity generation and the high wind generation in some countries have been the most important causes of its decrease. However, in the fourth quarter a large number of French nuclear power plants were subjected to additional controls and could not offer its energy to the market. For this reason the market’s EPEX SPOT-France experienced very important price increases that were also reflected in neighboring markets such as MIBEL, N2EX or IPEX. In addition, the price of the fuels recovered the upward trend and also contributed to the price increases. The EPEX SPOT-Phelix market was the least affected by the context of high prices thanks to its high wind power production. Data sources: EPEX SPOT-France – EPEX SPOT, EPEX SPOT Phelix – EPEX SPOT, N2EX – NORD POOL, IPEX – GME, MIBEL – OMIE. The prices of the N2EX market are expressed in €/MWh, calculated from the original values in £/MWh. 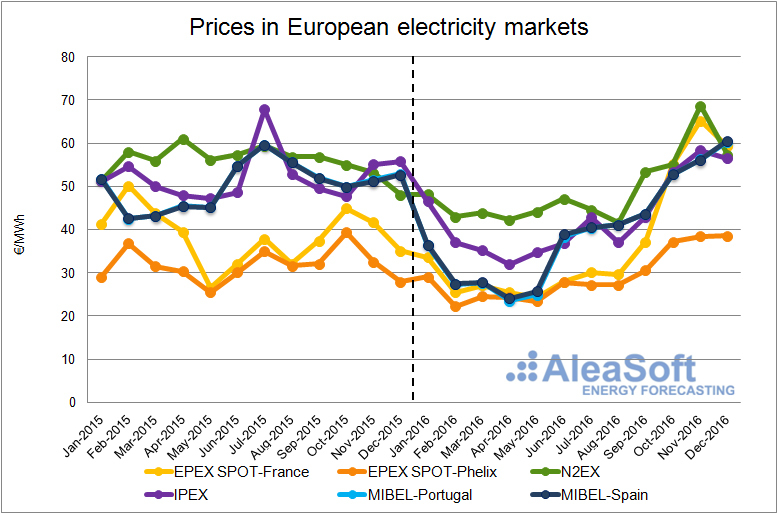 The price of electricity in the MIBEL market of Spain and Portugal, has suffered significant annual declines in the first three quarters. For Spain, specifically 15.19 €/MWh, 18.81 €/MWh and 13.97 €/MWh for the first, second and third quarter respectively. For Portugal, the descents were of 15.43 €/MWh, 19.58 €/MWh and 14.07 €/MWh for the same quarters. In the fourth quarter the price rose 5.25 €/MWh for Spain and 5.01 €/MWh for Portugal under the influence of the French market and little wind and hydroelectric production. Thus, the average price for 2016 for Spain was 39.67 €/MWh, 10.66 €/MWh less than that for 2015, and for Portugal 39.44 €/MWh, 10.99 €/MWh lower than that for the previous year. It is worth noting the large difference between April’s average monthly price, the lowest of the year, which was 24.11 €/MWh for Spain and 23.50 €/MWh for Portugal, with December being the highest with 60.49 €/MWh and 60.27 €/MWh for Spain and Portugal respectively. In the last quarter of 2016, the EPEX SPOT-France market was substantially altered by the shutdown of several nuclear power plants, which led to an average price of 59.79 €/MWh, 19.20 €/MWh more than in the same quarter of last year. In this way, the annual decreases in the first quarter (16.11 €/MWh), the second (6.73 €/MWh) and the third (3.56 €/MWh) were largely offset. Then the average price for 2016 for this market was 36.75 €/MWh, 1.73 €/MWh less than in 2015. In addition, in 2016, the hourly price of the MIBEL-Spain market was equal to that of the EPEX SPOT-France market 30% of the hours, while in the year 2015 only 13% of the hours occurred. This has been possible thanks to the increase in interconnection capacity between France and Spain operating since 5th October 2015. 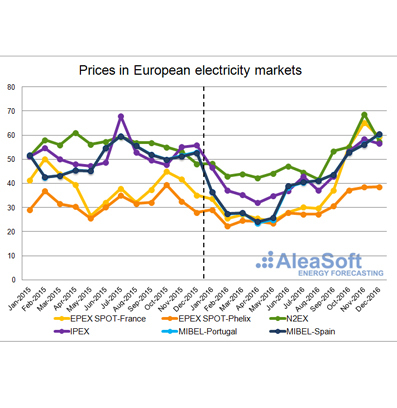 During 2016, the EPEX SPOT-Phelix market in Germany and Austria, with an average price of 29.18 €/MWh, decreased 2.58 €/MWh compared to 2015. Also in this case, the first three quarters recorded year-on-year decreases of 7.00 €/MWh, 3.51 €/MWh and 4.63 €/MWh. In the fourth there was a rise of 4.75 €/MWh, reaching a quarterly price of 38.02 €/MWh. The price increase was not as abrupt as in the French case due to the effect of high wind production. In the UK N2EX market, the average price in 2016 remained at 40.44 £/MWh, varying only by +0.01 £/MWh from the average for the previous year. The weakening of the British currency against the euro, especially after the “Brexit” referendum on 23rd June, led to a 6.60 €/MWh drop in the market value of the common European currency, reaching an annual price of 49.12 €/MWh. 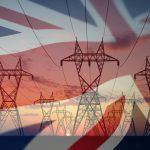 Average prices for the first three quarters were lower than last year, respectively, 6.17 £/MWh, 6.91 £/MWh and 1.89 £/MWh lower, in line with the price of NBP gas, a benchmark in the United Kingdom. It should be noted that the increase in the price of coal has not had effect, as would have been expected a few years ago, because of the drastic reduction of electricity generation with this fuel. As an example, during the third quarter coal electricity was 3.6% of the total, while in the same quarter of 2015 it represented 16.7%. In the fourth quarter the price of NBP gas rose again and the influence of the French market was noted, so the average price of the quarter was 14.83 £/MWh higher than in the same quarter of last year. In the Italian IPEX market, year-on-year declines of 12.16 €/MWh, 13.39 €/MWh and 15.78 €/MWh were recorded for the first, second and third quarters and an increase of 3.15 €/MWh in the fourth. The average price in 2016 was 42.78 €/MWh, 9.53 €/MWh less than in 2015. 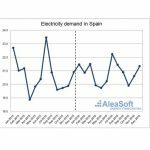 Aleasoft forecasts indicate that, in general, the price of electricity in the main European markets will be higher in 2017. After the fall of 2015, the price of Brent’s crude oil reached its monthly low in January at 30.70 $/bbl. Throughout this year progress has been made in agreements to limit production within and outside OPEC. As a result of these advances in the first half, the price rose moderately and stabilized in the second half around the average of 47.50 $/bbl. In December it resumed the upward trend with the highest monthly value of the year of 53.35 $/bbl. On average, the price of Brent’s crude oil in 2016 was 43.56 $/bbl, 8.82 $/bbl lower than in 2015. The price of CIF ARA coal, a benchmark in Europe, has experienced a strong increase in 2016. From its February minimum monthly value of 44.03 $/t to the December maximum (87.23 $/t), it has not left to grow. The annual increase over 2015 was 3.41 $/t leading to an average price of 59.75 $/t for 2016. In 2016, the price of Zeebrugge gas and NBP gas experienced its annual average price decline compared to 2015. During the first half of the year, the Zeebrugge gas price increased by ‑5.78 €/MWh, and the price for NBP gas was ‑3.51 £/MWh. By contrast, in the second half of 2016, both the average price of Zeebrugge gas and NBP gas increased year-on-year (2.01 €/MWh and 1.70 £/MWh, respectively). 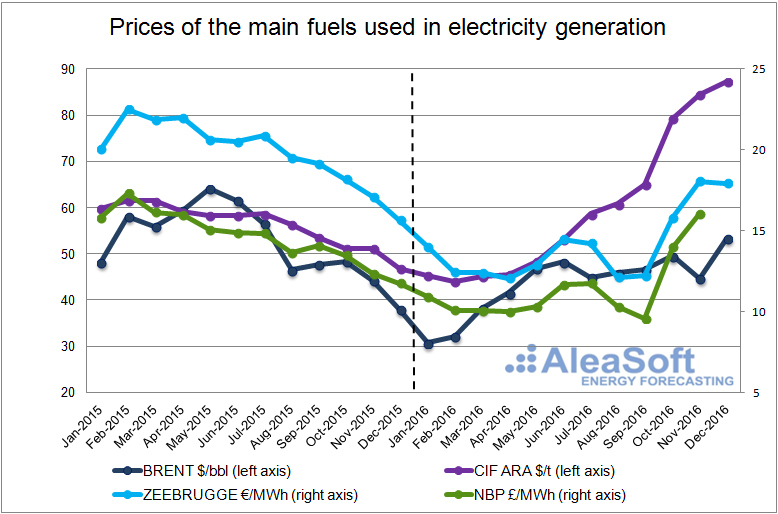 Average prices for 2016 were 14.05 €/MWh for Zeebrugge gas and 11.68 £/MWh for NBP gas. Data sources: CIF ARA – EEX, BRENT – EIA, ZEEBRUGGE- NetConnect Germany, NBP – ICE ENDEX. The forecasting scenario for fuels used by AleaSoft foresees that the price of all fuels will be lower than in 2015. The forecast scenario for fuels used by AleaSoft foresees that in 2017 the prices of all fuels will be higher than in 2016. 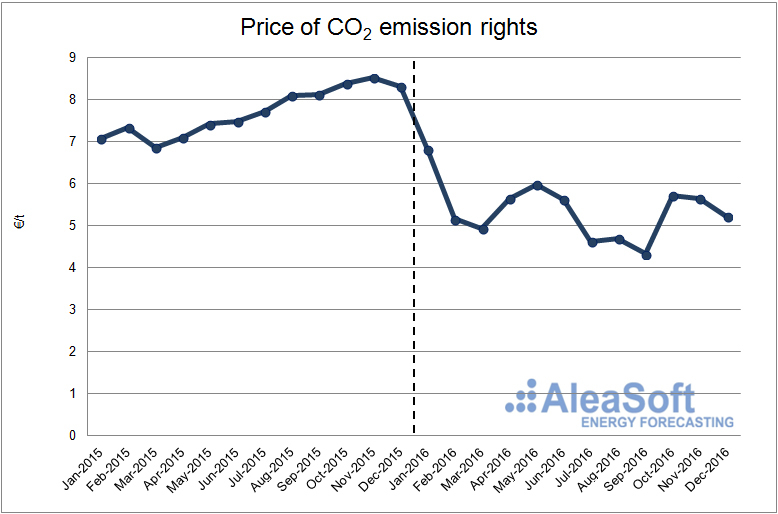 The average annual price of CO2 emissions rights in 2016 has decreased by 2.33 €/t compared to 2015, standing at an average annual price of 5.36 €/t; thus, ending the upward trend experienced in 2015. Aleasoft’s forecasts predict that the price will remain stable in 2017.